HOLLYWOOD—Mexican film auteur Guillermo del Toro earned three Oscar nominations Tuesday for his fable-like sci-fi romance “The Shape of Water,” which has been soaking up trophies throughout this awards season. Del Toro was nominated in the directing, writing (with co-writer Vanessa Taylor) and producing (the best picture category, with fellow producer J. Miles Dale). 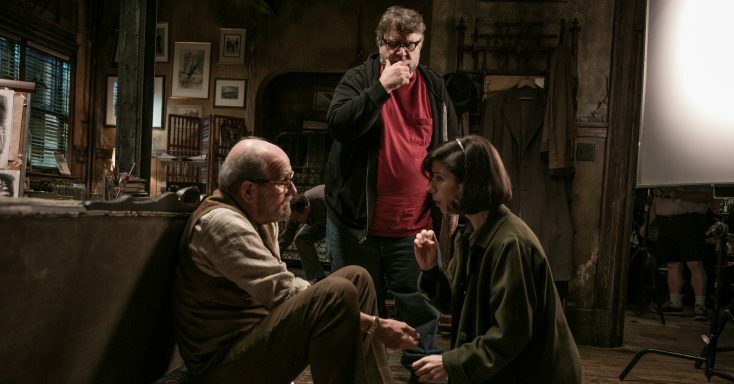 The last time del Toro received an Academy Award nomination was 11 years ago for his screenplay of “Pan’s Labyrinth,” also a fable-like story about a girl and a creature although set against the backdrop of war. “The Shape of Water” tells the story of a mysterious river creature (“Star Trek: Discovery’s” Doug Jones) held captive by a sadistic military scientist (Michael Shannon) in a secret U.S. compound, and a mute cleaning woman (Sally Hawkins, also Oscar-nominated) who falls in love with the tortured creature. The film, set during the Cold War, also earned Oscar nods for supporting actor Richard Jenkins, supporting actress Octavia Spencer, who plays helpful friends of the mute cleaning woman, as well as eight more award nominations including Best Original Score, Production Design and Cinematography. 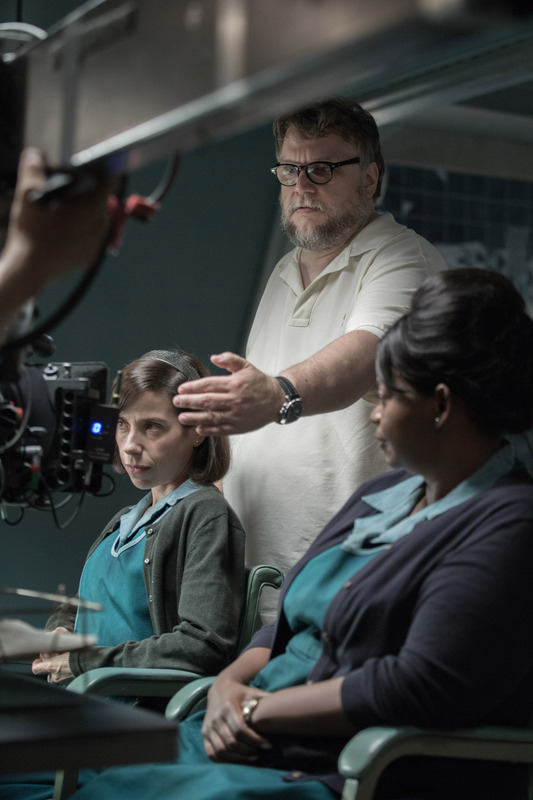 Before the film was released in theaters last fall, del Toro spoke about its inspiration, his love of monsters and that time he spotted a UFO. Q: Is your love for monsters, for the outsider, a way of coping with some kind of self-loathing? del Toro: Of course it is. Telling stories is a form of coping with self-loathing. The choice is the balance between living life and talking about it. That’s the storyteller’s life. When I was a kid, I told more stories than I lived. Then as a teenager, I lived more than told stories. At different points of my adult life, the balance is one side or another. You have to live to tell stories. You have to be a participant in the world to tell stories about it, but that is the balance. Q: Have you been building to a film like this where the creature can be a serious romantic character? 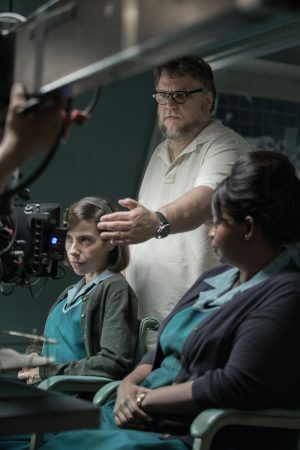 del Toro: Not so much that, but in a strange way, the 25 years I’ve been working as a film director did lead to this movie in many other ways; the level of freedom and the fact that I’m finally exhaling as a filmmaker. I just feel very comfortable and I can go from thriller to musical to drama to comedy in the same movie and the way I work with actors and thematically what I’m talking about is what I feel as an adult. All those things, yes. I have had leading men monsters in the past. “Hellboy,” which took three years to make that makeup, exactly as this makeup took three years to make. It’s because they were leading men and you have to sculpt it. When people say, “Oh, it’s Ron Perlman painted red.” No, every inch of Ron Perlman is covered in foam latex, except his upper eye lids. The rest is not real. His teeth are not real, his eyes are not real. Everything is artificial, but I think it’s a real compliment because “Hellboy” looks very much alive. This character (Doug Jones’ Amphibian Man) again took three years to design and execute because we were creating not only a leading man and a star, but we were creating a primordial, elemental god from the water, and we needed to proportion it and make the demeanor of the sculpture and the paint job already be part of the acting. Q: This film is about the demonization of people, of someone who doesn’t look like us, who is disabled, who is a different sexuality than us. Has that been impacted by the way particularly Mexico has been demonized in the last year and a half by the person who is now in the White House and by divisiveness that’s been happening? del Toro: Yeah, but it’s been going before. Let me put it this way, some people say what we are experiencing, well it started way before. That’s why the movie’s ’62. The thing is, it’s not only specific to one problem. It’s specific to the fact that ideology has permeated our lives to the point where we can demonize a person with one word. Nobody is one thing. Nobody’s just one thing. If you name one person, one thing you can hate through ideology, then you can beat that person, you can make that person mute, invisible, arrest, deport, anything, vilify. But if you get to spend time with that person and understand that person, you’ll see that we are all polychrome. The danger right now is that the social discourse is black or white. The only place we can be human, really human and breathe, the only place with oxygen, is grey. If we don’t understand that, we are heading for disaster. We really are. That’s why I wanted to make the movie, because I feel that the way we “look at the other,” which is embodied by the creature, tells us who we are. If we choose to not fear it but love it, it’s different. Look at the creature. Strickland (Michael Shannon’s character) looks at the creature as a filthy thing that came from South America. (Michael) Stuhlbarg, the Russian scientist, sees the same creature as a miracle of nature. Giles (Jenkins) sees this creature as a god that is going to give him hair. Elisa (Hawkins) sees this creature as the missing piece of the puzzle of who she is. She didn’t want a prince. I show in the beginning of the movie that she has a pretty nice life. She has a really good friend, she has a life that is not a huge life but she is happy with it. But when she sees Amphibian Man and he sees her, they recognize essentially that they belong together. Q: You have a fantasy song-and-dance number with Sally Hawkins and Doug Jones in the film. How much fun was it shooting that? del Toro: A lot of fun, because the thing with that scene is I knew when I made the two characters silent, it’s because you can lie with words, or you’re going to lie with looks. Love, you cannot talk about love. Anything you say about love is reductive. “Oh, I love you, You’re the love of my life. I adore you.” Of course you do. I don’t get it. But if you look at me, and I feel that you’re looking at me in my totality, that you know my good things and my bad things, then you look at me with love. I thought the great thing about that number is the only way to talk about love with words is to sing, and I thought what she feels for him is so big that she goes, “You will never know just how much …” I thought it needed to be a very celebratory moment for her, that makes her emotion as big as the movies she loves. That’s why it’s shot with a crane. The crane swoops and goes because she’s completely telling him finally in her head how she feels about him. Q: Your creature is so beautifully designed. What was it like on the set the day of the big reveal with Doug Jones? del Toro: I was so obsessed with this creature that it was weeks before we shot and the main color. If you go to my Twitter page, you will see the change. The main base of the color was a blue grey. I put it in front of the camera and I realized it was the wrong color. When it was affected by the cyan color light, it became muddled. Some people were going, “Oh, ooh, ah.” I was like, ‘Oh, ****!” Then I called everybody and I said, “We’ve got to go to nicotine and everybody was in a panic because we had no money and we were shooting right away. I said, “We’ve got to go to nicotine.” The day he comes out of the water, which was the second day we shot with him, that was a big moment. I told Doug, “Raise up as if you were 20 stories high. Raise really slowly and then find your center on the hip.” He moved like a god. Q :How long did it take to get Amphibian Man’s look just right ? Was it a long process? Q: You’re reportedly going to take a break from filmmaking for a while. Is that true? Q: Where do you get these ideas? Do you wake up in the middle of the night? Q: Has a specific vision been shaped by your childhood experiences in Mexico—surrealist, magical? Most of the people I know in Mexico have had extraordinary experiences with ghosts or aberrations, and we discuss them in a very natural way. I, myself, have had my share of weird stuff happen—and I’m a skeptic. Q: What kind of stuff? del Toro: I saw a UFO at age 16, for sure. I wish it was a great tale. I would tell you it’s a great design but it was so crappy. It was a flying saucer with lights, a circle. If I was lying I would make a better design, but it was just like they show it in the TV. A friend and I were on a highway and we saw a light on the horizon moving super-fast and I said, “Honk and flash your lights.” The thing went from there to 1,000 meters away in less than a second. It was exactly as they do it in the movies. I tell you, if I was lying I would go, “It was not like that!” We got scared, jumped in the car and drove away, very scared. It followed us for a few seconds and then I looked back and it was gone. Q: Did you tell anyone? del Toro: Oh yeah. I told everybody, immediately. Q: Did they believe you? del Toro: Yes, because most everybody in my family has seen a flying saucer.